As a followup to Blaming The Gun For The Battle Losses, WeaponsMan posted an interesting response. … we think he’s missing the degree to which the terrain favored the enemy, and we think he’s missing the very-close nature of some of the enemy positions. True, some of the crew-serveds were 900 meters out, but a lot of bad guys were within 100 meters, in trees, buildings and behind cob walls. It was a knife fight, compounded by the fact that the enemy alone had good covered and concealed firing positions. Then, there’s one minor point where he’s off on a factual item: he suggests they should have had DMRs armed and designated. They did, but the only one on OP Topside was killed instantly, in the first enemy volley; he had no chance to employ his M21 (a sniper-fied M14). Topside was well equipped with machine guns (2 x 240 and 1 x 249)… and well-supplied with valor. Topside’s crappy position didn’t offer good cover, concealment, observation, and fields of fire — only to the enemy. It was a lousy position for an OP, for MGs, or for snipers. But the officer that picked it was concerned that it would have direct line-of-sight to the main position so that it could be reinforced (or withdrawn) if need be. Well, it’s difficult if not impossible to mention everything at one time in a single article. I did indeed mention terrain, and in multiple previous posts. I suppose there was a way that a VPB could have worked at that location, but they would have had to find a way to mitigate the advantage they offered to the enemy with the choice of terrain. They didn’t. Similar to WeaponsMan, I was highly critical of the way Topside was chosen and manned. As to the DMs, I suppose I could make myself clearer than I did in the previous article. I am not saying that they didn’t have DMs. I am saying that they should have had multiple DMs. Marine Battalions deploy with an entire Scout Sniper platoon, while at the same time having DMs in the other platoons. My son was a DM even though he was a SAW gunner, meaning that he had gone through all of the shooting qualifications Scout Snipers do, without the field testing for ingress, concealment, and egress. Daniel told me he thought he lacked the discipline for that (one Scout Sniper told me that during field testing he inadvertently crawled on top of a red ant hill, was bitten hundreds of times, but had to remain still in order not to be detected). The Paratroopers at Wanat were thrown into a buzzsaw by well-intentioned and bold commanders, who thought they could get away with it just long enough for the small element there to build a secure COP. (Remember, they opened it on the 9th of July and neck-deep in malignant hadjis on the 13th, with the position still in the hasty-establishment mode). Other Taliban assaults in Nuristan had taken longer before the enemy massed, up to a month. And these prior attacks had displayed specific indicators, you might say signatures, and American leaders worked on the assumption that they had about the same time before an attack at Wanat was an enemy capability, and the assumption that they again would receive these indicators and signatures of enemy positioning. As it happened, Wanat appears to have been closer to home for the insurgents, and they didn’t generate the distinct signatures that they had done before other attacks like the one on COP Bella. Oh, but there’s much more to it than that. VPB Wanat did indeed have concertina wire, HESCO barriers and other means of force protection, but in every direction the base was on the low ground. One particularly fateful decision was the construction and garrisoning of Observation Post “Top Side,” which sat on slightly higher ground to the East of VPB Wanat. I have contrasted this practice with how the Marines have done it under the umbrella and command structure of the MAGTF (this URL is cited on page 255 of the Cubbison report), and while I don’t know how the VPB at Wanat was constructed (by a contractor like KBR? ), it could have be accomplished much sooner. This failure was a catalyst for the massing of enemy forces. The Army’s official history of the battle of Wanat – one of the most intensely scrutinized engagements of the Afghan war – largely absolves top commanders of the deaths of nine U.S. soldiers and instead blames the confusing and unpredictable nature of war. The history of the July 2008 battle was almost two years in the making and triggered a roiling debate at all levels of the Army about whether mid-level and senior battlefield commanders should be held accountable for mistakes made under the extreme duress of combat. 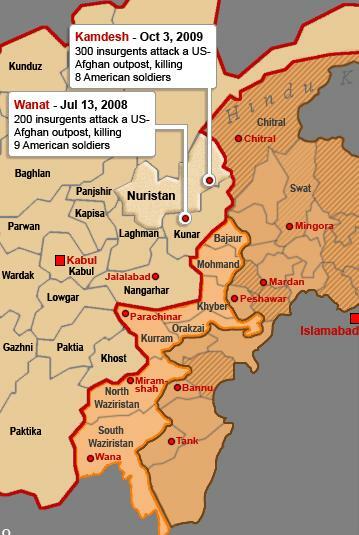 An initial draft of the Wanat history, which was obtained by The Washington Post and other media outlets in the summer of 2009, placed the preponderance of blame for the losses on the higher-level battalion and brigade commanders who oversaw the mission, saying they failed to provide the proper resources to the unit in Wanat. The final history, released in recent weeks, drops many of the earlier conclusions and instead focuses on failures of lower-level commanders. The battle of Wanat, which took place in a remote mountain village near the Pakistan border, produced four investigations and sidetracked the careers of several Army officers, whose promotions were either put on hold or canceled. The 230-page Army history is likely to be the military’s last word on the episode, and reflects a growing consensus within the ranks that the Army should be cautious in blaming battlefield commanders for failures in demanding wars such as the conflict in Afghanistan. Family members of the deceased at Wanat reacted with anger and disappointment to the final version of the Army history. The initial investigation, conducted by a three-star Marine Corps general and completed in the spring, found that the company and battalion commanders were “derelict in their duty” to provide proper oversight and resources to the soldiers fighting at Wanat. Petraeus reviewed the findings and concluded that based on Army doctrine, the brigade commander, who was the senior U.S. officer in the area, also failed in his job. He recommended that all three officers be issued letters of reprimand, which would essentially end their careers. After the officers appealed their reprimands, a senior Army general in the United States reversed the decision to punish the officers, formerly members of the the 173rd Airborne Brigade. Gen. Charles Campbell told family members of the deceased that the letters of reprimand would have a chilling effect on other battlefield commanders, who often must make difficult decisions with limited information, according to a tape of his remarks. He also concluded that the deaths were not the direct result of the officers’ mistakes. In its conclusions, the study maintains that U.S. commanders had a weak grasp of the area’s complicated politics, causing them to underestimate the hostility to a U.S. presence in Wanat. But the history focuses mostly on the failures of lower-level commanders to patrol aggressively in the area around Wanat as they were building their defenses. It also criticizes 1st Lt. Jonathan Brostrom, a 24-year-old platoon leader, for placing a key observation point in an area that did not provide the half-dozen U.S. soldiers placed there a broad enough view to spot the enemy. “The placement of the OP [Observation Post] is perhaps the most important factor contributing to the course of the engagement at Wanat,” the report states. The initial investigation, by contrast, found that the placement of the post was not a major factor in the outcome of the battle. That investigation also found that mid-level Army officers failed to plan the operation beyond the first four days and as a result failed to provide sufficient manpower, water and other resources to defend the base from a Taliban attack. The official history makes little mention of such conclusions. This information and perspective is mostly known to regular readers of The Captain’s Journal. We have discussed the Battle of Wanat many times before, and linked the final report as soon as it was released (as well as commented on the original Cubbison report). The main theme of Jaffe’s analysis is the reversal of reprimands for senior staff level officers and the switch to holding lower level field grade officers accountable for the failures. But there are other aspects as well, and we must address those in order to crawl through the weeds. Unfortunately, the weeds block our view and add little to nothing to the overall reality of the situation. Local intelligence, also from tribal elders, pointed to massing of forces and planned attacks on VPB Wanat. However complicated the tribal machinations and our attempts to understand them, they weren’t so complicated that we didn’t have good intelligence or even good counsel. Had we followed the elder’s advice, the patrol base might have been manned and fortified well before the massing of forces that occurred by the Taliban, and in fact local atmospherics might have been different with time for interaction with U.S. forces. It’s tempting to point the finger at weapons systems, just as it is tempting to fault the company with lack of soft COIN efforts. But in the end, they were outnumbered about 6:1 (300+ to about 50), they were on a poor choice of terrain, they had poor logistics, they suffered lack of air and artillery support, and most importantly, they simply were never given the proper number of troops or the resources to engage in force protection, much less robust force projection. They were under-resourced, and no analysis of weapons systems can change that fact. Rather than focus on why the M4 jams after firing 360 rounds in 30 minutes, the real question is why this particular M4 had to be put through this kind of test to begin with? It’s wise to deploy the right weapons for the job, and if that means that each squad carries an M-14 for the DM position, then so be it. Commanding officers should make that happen. There are plenty of M-14s left in our armories, and they should be put to use in the longer distance engagements. But in the end weapons systems malfunctions is simply not a compelling excuse or even one of the root causes of what happened at Wanat. It just isn’t, and time spent on worrying over that is time wasted. Col. David Brostrom is rightfully indignant over his son’s role in the report. Dead men cannot defend themselves, and Lt. Brostrom represents too easy of a target. In that respect, the final report is petty and cowardly. Nonetheless, I maintained, and continue to maintain, that OP Top Side was a poor tactical choice. Most of the men who perished that fateful day did so attempting to defend or relieve OP Top Side (8 of the 9 who perished), and the kill ratio that day still favored the U.S. troops (“There were between 21 and 52 AAF killed and 45 wounded. Considering a clinical assessment of kill ratio can be a pointer to the level of risk associated with this VPB and OP. 21/9 = 2.33, 52/9 = 5.77 (2.33 – 5.77), and 45/27 = 1.67. These are very low compared to historical data (on the order of 10:1).”). I definitely disagree with the idea of OP Topside as far-flung. It was only located 60 yards from the edge of VPB Kahler. In fact, the Company Commander was not pleased with the placement of OP Topside, but the LT believed placing the OP among the bounders in proximity to Kahler would make it easier to reinforce if a big attack did come. This in fact, proved to be the case as Topside was reinforced multiple times and proved the key to defeating the enemy attack at Wanat. Separating the people from the Americans is also a bit exaggerated (or at least, somewhat irrelevant) when discussing the battle proper. Using only open source information, we can develop patterns of behavior with the Taliban that would have alerted U.S. commanders to expect such massing of forces. If I can do it, Army intelligence can do it. Good historiography brings in all elements of the problem to set the proper context, but even with proper context the basic outline of the problem doesn’t change. There weren’t enough U.S. forces. It took too long to set up VPB Wanat. The Taliban worked much more quickly than did we in setting up their military operations. The U.S. sacrificed control of key terrain around VPB Wanat – and especially OP Top Side – in an attempt to provide proximity to the population. They summarily ignored both tribal counsel to set up the patrol base and tribal intelligence concerning massing of forces and imminent attacks, attacks that in fact followed tactics that could even be known by studying open source information. Bing weighs in on holding officers accountable, and demurs insofar as it costs us openness and a learning environment. Whatever. I will observe that Marine Corps concepts of force projection and force protection are different and generally more aggressive. Aggressiveness could have helped in the Waygul valley, but their aggressiveness was limited by the lack of resources. Col. Brostrom is right about holding commanding officers accountable. If his son objected to the placement of OP Top Side, so much the better. But whatever responsibility must be shouldered for the engagement, it increases with increasing rank. Pressing authority up and accountability down is the tactic of cowards. Refusing to hold higher ranking officers accountable for fear of creating a climate of suspicion runs both directions. If we cannot hold senior officers accountable, then neither can we (morally and rightly) hold lower ranking field grade officers accountable. And if we hold anyone accountable, higher authority means shouldering more of the responsibility. It’s just the way it is. This is true in the family, in business, in relationships, and in church. To claim that it could be anything else in the military is laughable and worthy of ridicule. What Really Happened at Wanat? The Battle of Wanat has been in the news lately. Richard Engel with MSNBC did an expose on Wanat, and still grieving father David Brostrom says a number of wise things concerning the battle, but veers eventually into the lack of soft efforts (building schools, interacting with the population, etc.). In previous articles I have disagreed with this perspective, since it makes no sense to charge Chosen Company with lack of COIN efforts when they were in a deadly fight for their lives on an hour by hour basis for the entire deployment. Besides, Major Jim Gant gives us a realistic perspective concerning these things. This is nothing more than a side bar comment as I have not studied nor read the details of what occurred at Wanat. However, at the same time we were conducting tribal engagement with the Mohmand tribe (2003), we were also conducting combat operations in the Pesch Valley and the Korangal Valley. The details of these missions are not important. However, we had two informal “meetings” with the tribal leaders in and around the area where Wanat is located. The first time we held a meeting they informed us they did not want us coming through their tribal area. I explained to them, in detail, that we had to move through that area in order to accomplish other missions. I emphasized that we did not want to fight their tribe. They told us that we were not welcome there and if we came through their again that we would have to fight. My answer was simple,”OK. Let’s finish lunch together and then we will fight.” That very day we were involved in a very large fight with them on our way out of the valley. Several weeks later, the tribal elders came to our firebase and we had another “meeting.” The same topics were talked about. We enjoyed a very nice lunch together and the outcome was – we will continue to fight. We could not come to any type of agreement on how we could work this issue out. So we continued to conduct combat operations to include raids in their tribal area. But at least we understood each other. One last note. The terrain there was by far the most difficult terrain I have ever fought in. Once again, this isn’t a statement about Wanat per se, but the tribes who live in and around the area. They are a tough, fighting group of people. The U.S. Naval Institute Proceedings has recently published an interesting analysis of the role of weapons in the battle of Wanat, entitled “What Really Happened at Wanat.” Excerpts are give below (and the reader is left to visit the USNI web site for further study). Immediately after the release of the Army’s Occasional Paper, press reports seized on Soldiers’ accounts of weapon stoppages detailed in it. The Times reported that “Soldiers who survived the battle described how their automatic weapons turned white hot and jammed from nonstop firing.” A November 2009 Defense News story also cited reports of weapon stoppages, but went further, attempting to connect the deaths of Soldiers in the battle to the enduring debate over the reliability and lethality of the military’s primary infantry weapon, the M4 carbine. Since its introduction with U.S. forces during the Vietnam War, the M16 rifle and its offspring, including the M4, have been the subject of some controversy, especially related to reports of the weapons’ reliability in combat. Initial reports from Vietnam indicated a high incidence of stoppages. These were in fact directly related to the Army’s initial decision to alter the ammunition’s propellant from military specifications (mil-specs) and to dispense with chrome plating the M16’s chamber—an improvement that had become a standard feature of all U.S. military small arms since World War II. Yet troops outnumbered at Wanat, like those described in the Khe Sanh account 41 years before, were still plagued by numerous weapon stoppages. Studies conducted by the Army, by independent research institutions, and by Colt itself offer some indication of the cause. In particular, they provide some possible explanations for the numerous stoppages suffered by Wanat’s defenders. The Army’s draft Occasional Paper states that to maintain fire parity with their attackers, the Chosen Few Company soldiers “were firing their weapons ‘cyclic,’ on full automatic at the highest possible rates of fire.” For this reason, the paper concludes, some Soldiers experienced stoppages. This same thread is pulled in the Douglas R. Cubbison study out of Leavenworth (I still won’t release or publish this paper since it has not been publicly released). I find the issue of weapons reliability to be a compelling theme, but in the end, an incorrect one. It isn’t surprising that an M4 that has fired 12 magazines within 30 minutes no longer functions properly. Better, more reliable weapons could have been provided to the men of Chosen company (e.g., piston rather than direct gas impingement), and the outcome would still have been the same. Regarding the Battle of Wanat that has received so much attention here at TCJ, it appears as if the field grade officers involved in the planning and decision-making for the outpost have been issued career-ending reprimands. Myer, along with two of his superior officers who were not at the battle, have received career-ending letters of reprimand for failing to prepare adequate defenses in the days leading up to the attack. 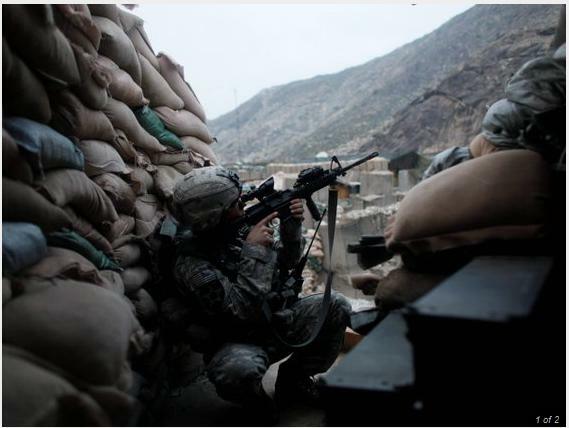 Forty-nine Americans and 24 Afghan soldiers had been ordered to set up the outpost deep in enemy territory. It was July of 2008, and according to Sgt. David Dzwick, they were short of not just troops, but basic necessities. “The second day we were extremely low on water,” Dzwick said. “When you start running out of water it’s very hard to continue working through the heat of the day. Despite warnings from villagers that an attack was imminent, an unmanned surveillance drone which had been watching over the troops was diverted to a higher priority mission. The first Apache helicopters got there an hour and five minutes after the Taliban opened fire. By then, Captain Myer was the only officer still alive. Myer can still appeal but right now he has been both decorated and reprimanded for the same battle. I am no fan of witch hunts, and in general I think such things are destructive of any organization which implements such tactics. Furthermore, we must allow our military to be a learning institution, and if errors cannot be silently addressed, then intransigence will win the day. Yet … the failures at Wanat are severe. We have discussed them in detail: failure to believe local intelligence, lack of timeliness in setting up the Vehicle Patrol Base (almost one year of negotiating with the local elders to obtain their approval) allowing Taliban to plan, deploy and mass forces, lack of force protection, lack of logistics, awful terrain problems with the VPB and especially Observation Post Top Side, lack of adequate forces, and so on the list goes. But why stop at Colonel? The same kinds of expectations are still customary in other parts of Afghanistan. BALA MURGHAB, Afghanistan — The gunfire came as no surprise, several short volleys smacking the dirt as soldiers bounded across an open field. The U.S., Italian and Afghan soldiers were keenly aware that by venturing just a few miles south of their base, they’d crossed into enemy territory. Taking fire was almost a given. 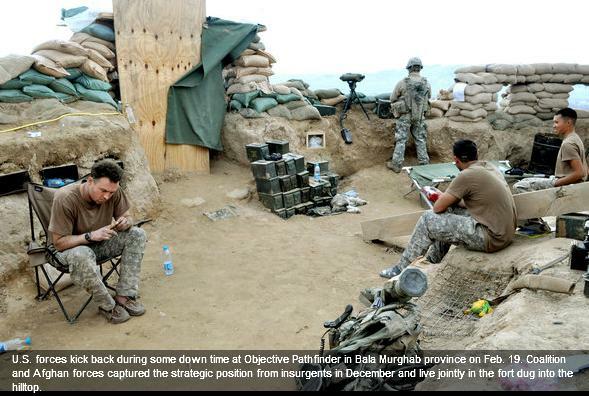 Since November, the men of the 82nd Airborne’s 1st Battalion, 508th Parachute Infantry Regiment have fought pitched battles in Bala Murghab to take a small bubble of key terrain in this Taliban-controlled valley in Afghanistan’s remote west. But the mission here is hamstrung by a shortage of forces. And except for these show-of-presence patrols, that security bubble is as far as they can go until Afghan reinforcements arrive. Insurgents sit to their north and to their south, ready at the trigger. For the men of Company B’s second platoon, it feels like being on the front lines of the wrong war. “This is just no man’s land crawling with Taliban, and one small platoon sitting right in the middle of it,” said Hand. While it appears that they have dealt with the terrain issues, they are ready-fodder for a massed assault. So where does the accountability end up the chain of command, and how does this get balanced with the need to be a learning institution? Expectations clearly continue to point in the direction of insufficient troops to meet the demands being placed on them.